Most pre-1969 models with calendar complications were part of the Dateline series. There were A-models and T-models, depending on if they had Accumatic movements or Thin-o-matic movements. The 1965 Dateline T-480 was a Thin-o-matic model with a date complication. It was produced through 1969. As you can see in the catalog snip, the T-480 has a 10K yellow gold filled case. It came on a bracelet or a strap. 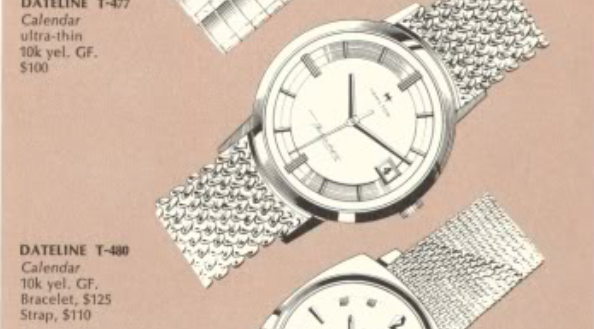 What you can't see in the catalog ad is the watch is very yellow overall, as even the dial is a golden color. I recently received a T-480 project watch and it had it's original JB Champion bracelet. Unlike most bracelets, this model has a two-piece bracelet, sort of like a metal strap. It was a little "clunky" inside, as if something is rattling around inside. The case is a one-piece design and in the shot below you can also see the clasp for joining the two bracelet ends. Opening the watch, the source of the sound is obvious. The oscillating weight has come free of the movement. This is an odd failure, the screw that holds the weight on is still attached to the center of the weight. The weight has broken off. This movement uses an ETA-based movement called the Hamilton 624. It's the calendar version of the 623 movement that is also used in some Thin-o-matics without dates. The framework that enables to rotor to spin and wind the watch is attached with two screws. I'll remove those to lift off the framework. With the dial and hands removed you can see this movement is similar to the 694A movement that is used in the A-series of Datelines. However this 624 is a little different, for example, the date index lever on the right, currently engaging the date wheel at the number 21. It's also different in that the date wheel is golden in color. I'll strip the parts off the front of the manipulate and then flip it over to remove the parts from the back. The framework is now off and there's a large screw head to remove the remaining center portion of the rotor. I will see if I can press the two parts of the rotor back together. I'll need to pull out one of my staking sets. The center of the rotor is a tight fit, so a few taps to a stake should set it back in place. I need to choose a stake that will fit the recess in the center of the weight. A few tap, tap, taps, sets the two parts back together. Hopefully it will stay the way. All the parts are cleaned and dried. The reassembled movement is ticking away with good motion. It's off to the timer to find out how well it's working. I didn't wind the watch very much so that explains the low amplitude. The beat error isn't too bad but it's easy to adjust on this movement, so I'll give it a quick tweak. It doesn't take much of a tweak to bring the two lines more close together. That brought the amplitude up a little too. There are two springs on the front of the movement that could easily fly off, never to be seen again. So I'll reassemble the front of the movement inside my light tent. That way I can find the parts if they happen to disappear. This tent has saved me countless hours on my hands and knees looking for things. It's a little blurry but all the parts back together. The dial goes back on and then the hands are installed at 12:00 midnight so the date changes at the proper time. With everything else cleaned and polished, this watch looks like it just left the showroom floor.